Uterine fibroids (leiomyomas) are benign smooth muscle tumours of the uterus. They are the most common benign tumours in women, with an estimated incidence of 20-40%. The risk of a fibroid becoming malignant is 0.1%. In this article, we shall look at the risk factors, clinical features and management of uterine fibroids. Intramural (most common) – confined to the myometrium of the uterus. Submucosal – develops immediately underneath the endometrium of the uterus, and protrudes into the uterine cavity. Subserosal – protrudes into and distort the serosal (outer) surface of the uterus. They may be pedunculated (on a stalk). The pathogenesis of fibroids is poorly understood. Their growth is thought to be stimulated by oestrogen. Fibroids are usually benign and very rarely become malignant. Women with a 1st degree relative affected carry a 2.5x increased risk. African-Americans are 3x more likely to develop fibroid than Caucasians. The majority of women with fibroids are asymptomatic – they are often discovered incidentally on pelvic or abdominal examination. This includes urinary frequency or chronic retention. Subfertility – due to the obstructive effect of the fibroid. May occur in pregnancy due to red degeneration. This is where the rapidly growing fibroid undergoes necrosis and haemorrhage. Rarely, pedunculated fibroids can undergo torsion. A solid mass or enlarged uterus may be palpable on abdominal or bimanual examination. The uterus is usually non-tender. Leiomyosarcoma – malignancy of the myometrium. Adenomyosis – presence of functional endometrial tissue within the myometrium. Blood tests are usually reserved for patients where the diagnosis is unclear, or as a pre-operative work-up if surgery is indicated. 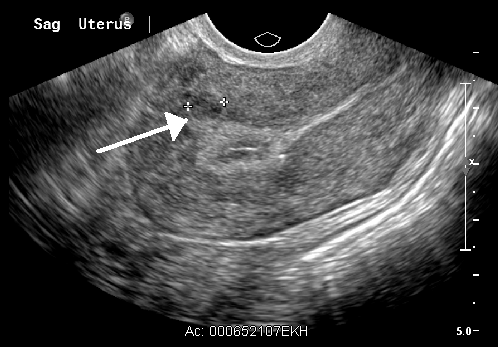 Fig 2 – An intramural fibroid on pelvic ultrasound. There are both medical and surgical options for the management of uterine fibroids. Asymptomatic patients with small fibroids often do not need treatment. Includes the COCP, POP and Mirena IUS. Suppresses ovulation, inducing a temporary menopausal state. Useful pre-operatively to reduce fibroid size and lower complications. 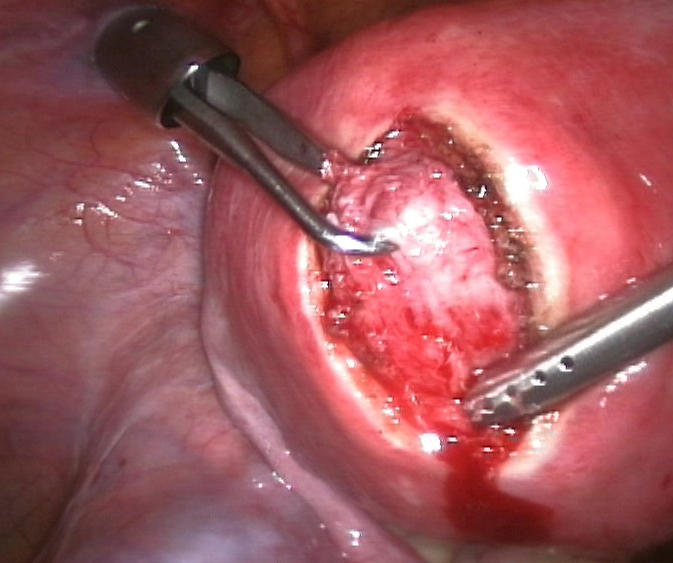 Fig 3 – A laparoscopic myomectomy. 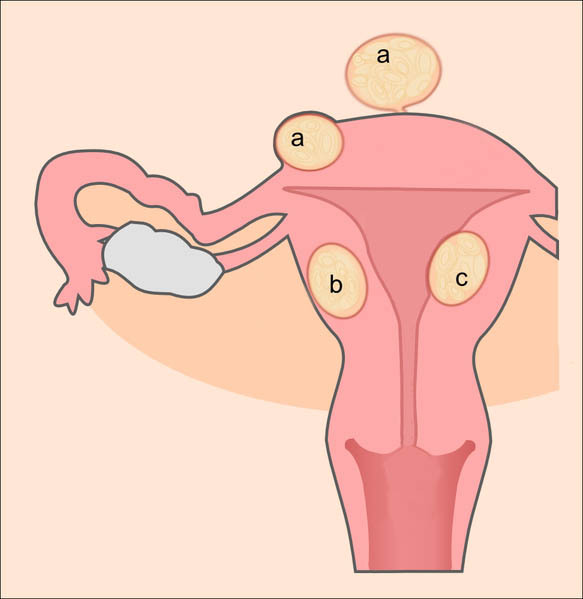 Uterine fibroids are a benign tumour of which tissue? What is the most common type of uterine fibroid? Which of the following is NOT a recognised symptom of uterine fibroids? What is the most appropriate initial investigation for suspected uterine fibroids? You are considering surgical management in a woman with fibroids. She still wishes to have children. What is the most suitable option?